The new label, which mimics the nutrition label look and style, was developed by the Association of National Advertisers’ Data Marketing & Analytics (DMA) division, the Interactive Advertising Bureau’s Tech Lab, the Coalition for Innovative Media Measurement (CIMM) and the Advertising Research Foundation (ARF). The label, which mimics the look and style of the FDA’s nutrition label, replaces nutrients fields with ones disclosing the source, collection, segmentation criteria, recency and cleansing specifics. The groups did not state how, where and when the label would be displayed on data products and services, but said interested parties can "test-drive" versions of the label at DataLabel.org or within a variety of participating digital DMPs (data management platform) and DSPs (demand-side platforms). Where the original data components were sourced. Required for each significant data source, this component includes details on data provenance, data collection techniques, refresh frequency, and event lookback window. 2 comments about "Ad Industry Unveils 'Nutrition Label' For Data Transparency". Marcelo Salup from Iffective LLC, October 1, 2018 at 10:58 a.m.
Ben Segal from RTB replied, October 2, 2018 at 7:37 a.m. 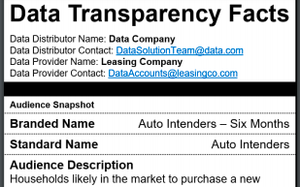 This DMA and ARF initiative is a cool start to improving data transparency. Quality 3rd party data provider should be able to tell you the source, cleansing, enrichment, expansion and refresh frequency for any given segment. Would also be great to know if it's modeled or deterministic, and how audience and device expansion was processed.